With a backdrop of 2300 vertical metres of the Remarkables mountain range and an armchair view of an outstanding lake panoramas, Jack's Point Golf course is one of the most visually spectacular in the world. As an 18 hole par 72 championship course offers golfers an exciting challenge with five tee positions to choose from, providing all golfers an unforgettable golf experience. The course has been designed around the natural landscape, with minimal excavation. The course measures 6388 metres (6986 yards) from the championship tees and is built on the most spectacular of Jack's Point terrain. 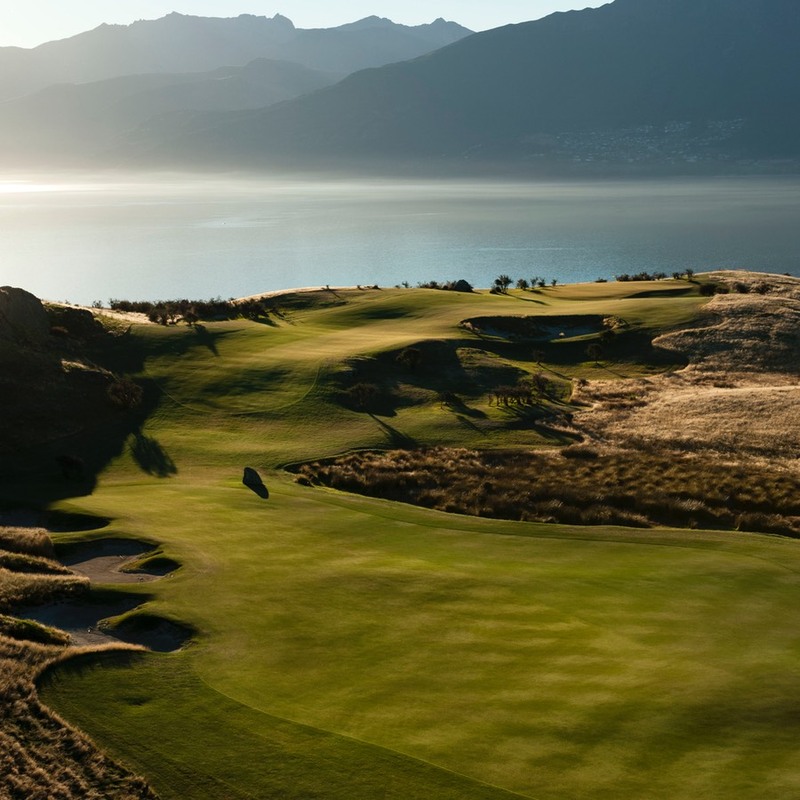 Designed in harmony with the natural environment, the course weaves through native tussock grasslands, dramatic rock outcrops, steep bluffs and swathes of native bush to the edge of Lake Wakatipu. The presentation of the course is second to none, which makes Jack’s Point one of the world’s great golfing experiences. Jack's Point is only 20 minutes from downtown Queenstown, the course is open for all visitors to enjoy 7 days a week in season. While this is a private course, we welcome the opportunity to show case our championship course to the golfing fraternity. Jack’s Point was simply unforgettable. * Replay rounds only available within 10 days of initial visitor round being played. All visitor and replay rates include complimentary use of driving range prior to play. Annual winter close down will occur mid-June throughout to mid-August. Youth rates available on application, players must have official handicap. Late cancellations may incur a penalty. Professional Coaching (individual or group) available by appointment. Rates subject to change at any time - management discretion. Please read the important Player Information on this page before you make a booking enquiry. We will respond to all booking requests within 24 hours during season. Office Hours 7 Days in season from 8:30 am to 6:00 pm (NZ time). Course is open from mid-August to early-June annually. Should you wish to write to us or speak with one of our team, contact details can be found here. Anniversaries, special birthdays or to simply to say ‘thank you’, Jack's Point Golf vouchers provide a one of a kind golfing experience. Please contact golf@jackspoint.com to arrange a gift voucher. Professional coaching is available by appointment with our NZPGA qualified pro. A magnificent driving range is adjacent to the Clubhouse for all to enjoy. Please contact golfpro@jackspoint.co.nz for more information. The golf shop stocks a range of men and women's golfing apparel, along with accessories to make your experience at Jack's Point even more enjoyable. Day of play – All players are required to complete check in and registration 30 min before their tee time. Times of play – The course is open for visitors from mid-August to mid-June annually. Closures – Each year we close the course over the cooler winter months from mid June to mid August for annual winter maintenance. In 2018 we are closed from 10th June and reopening 18th August. Course renovations – These are generally scheduled for mid April and mid September each year. In 2018 we are closed 24th to 28th September. In 2019 we are closed 29th April to 2nd May and 23rd to 27th September. Replay rounds – A reduced rate is available for all rounds within 10 days of initial visitor round. Method of payment – Currently this is on arrival; it is envisaged moving forward that payment/deposit will be required at time of booking. Alteration of a booking – Subject to availability, tee times can be moved a week either side at no additional charge. Cancellations - Deposits will be dealt with individually at this time. On the introduction of an “online payment system” all bookings will be required to make a deposit to secure the booking. The web site will be updated when these system changes are introduced. Speed of play – Players are requested to keep up with the match in front; failure to comply may result in removal from the course (No refunds). Rental clubs – Rental clubs are renewed every 2 years; current clubs are PING G; G400; i200; Rhapsody, available in men's and women's. Golf carts – all bookings will include a golf cart unless requested otherwise. Dress code – Smart casual which includes tidy jeans; all players must have suitable footwear (a no spike shoe policy applies). Clubhouse facilities – These include ladies and gents locker rooms, golf shop and food and beverage served throughout the day. If wishing to dine in the restaurant, prior booking is recommended. Practice range – Complimentary practice balls are available prior to all visitor rounds including use of the short game facilities. We use Titleist practice balls. Location/courses – Jacks point golf course is located in the Queenstown/Wakatipu area along with 4 other 18 hole golf courses within 30 min of each other. Queenstown is NZ’s number one destination. Large group bookings - (40 +) or tournament request - Please fill out the booking enquiry form and outline the event needs in the reservation request section (7) heading up attention Operations manager. Disclaimer – As pertains to all statements in golf booking enquiries, management reserves the right to change the terms and conditions without prior notice. For large group bookings, please email or phone us. All bookings will include a golf cart unless requested otherwise. Office Hours: Monday to Sunday NZ 08:30am - 06:00pm in season. Course closed mid-June to mid-August annually for winter maintenance. Enquires will be responded to within 48 hours in the off-season. Where did you learn about Jack's Point Golf? Your golf booking request has been sent to us. We will get back to you within 24 hours. If you have any questions, amendments or wish to cancel this request, please email or phone us using the contact details on this page. Should you wish to write or speak with one of our team please do so, as we appreciate your enquiry and wish to discuss special circumstances in person.